The President of The United States is dead. There is no Vice President to take his place. As the nation slips into a constitutional crisis, a small, secretive group conspires to violently seize power. They have the will. They have someone on the inside. And they have the explosives. Standing in their way is a woman who knows their intentions. Can she stop them in time? If she does, will it matter? This book of fiction is about the behind the scenes look at how people can be manipulated and used in politics. Will they subvert the system? Listen and find out. The character development was very good and I loved the narration. I'm not usually a political reader/listener, but this story has a pretty interesting plot that would be scary if it is actually true. 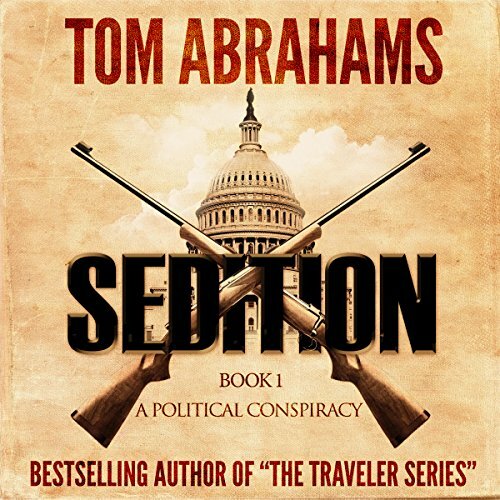 Sedition is a political thriller, and I found the book fascinating and wonderful to listen to. The story follows the lives of several people during a political crises unlike any we have seen so far. A president is dead, and a group is trying to take control of the government. I found the book riveting and easy to follow. I liked the short chapters as it made it easier to listen to and pause if needed. I found myself sometimes confused on the differences when chapters jumped from person to person on perspective. The narration by Kevin Pierce was also top notch. The Calvary is in town! Yes, especially given the election cycle we are in. Kevin Pierce does a commendable job with sometimes inconsistent material. His characters were intense, consistent and authentic. They are all damn fine. No single one was better than the other. Could you see Sedition being made into a movie or a TV series? Who should the stars be? Yes, actually. Perhaps an English version would be ideal. Recommended for what it is, which is political drama with conspiracy theory overtones. I was given a copy of this book by the narrator free of charge in return for an honest review through Audiobook Boom. What made the experience of listening to Sedition the most enjoyable? First of all this audiobook was given by the author, narrator, or publisher at no cost in exchange for an unbiased review via Audiobook Boom. This was the second series by Tom Abrahams that I have thoroughly enjoyed. Sedition weaves a tale of political conspiracy with references to current events that make this story a book I couldn't stop listening to. Kevin does a great job of telling the story as the Narrator. What other book might you compare Sedition to and why? Sedition reminds me somewhat of American Exit Strategy by Mark Goodwin. Both are tales of individuals force to take control of the American Government after a catastrophic event. My favorite scene from the story was the art opening and its hinge point in the storyline. It could have made the storyline go several ways. Also enjoyed the epilogue where the character of Maddie comes to a realization about her mother that had taken her years to get to. Can't wait for book two to be released to find out what happens with this cast of characters. Just a few hours in and really enjoying this book. Not sure where it is headed or how exactly we will get there, but I am thoroughly enjoying the ride. Superb narration, great characterization, voice and tempo. Again, nice to listen to a book without vulgar language. I'm a long term listener from now on. I look forward to the next novel in A Political Conspiracy series. Sedition is packed with action and suspense. It is not strong on character development. The story is about presidential succession when the VP pick has been made and approved by Congress, but has not been sworn in when the US president suddenly dies. Who should replace the dead president, the VP nominee or the Speaker of the House? It is an interesting question made more important by the House Speaker's determination to claim the presidency. Narration is superb. I liked this book. It was easy to listen to and it kept my attention. I'm use to listening to stories that have a central character that you follow throughout. Not always a hero but a main person of interest with all other characters coming in and out of the story. Sedition is not like that. I couldn't really attach to any of the characters. I'm thinking it's on purpose and is more like an introduction to book 2. I will definitely listen to book 2 with the hope that the characters will be more of individuals with depth. The narrator Kevin Pierce is great as always. I gave the overall a 4 rather than a solid 3 because the second book is already out. I definitely recommend this book. I received the audible edition free & had already been thinking about getting it because I enjoyed the Traveler series by the same author. Many twists & turns in the story & I enjoyed how they were presented. I also enjoy the narrator. I've heard him read a number of other books & his voice is perfect for the political thriller and similar genre.